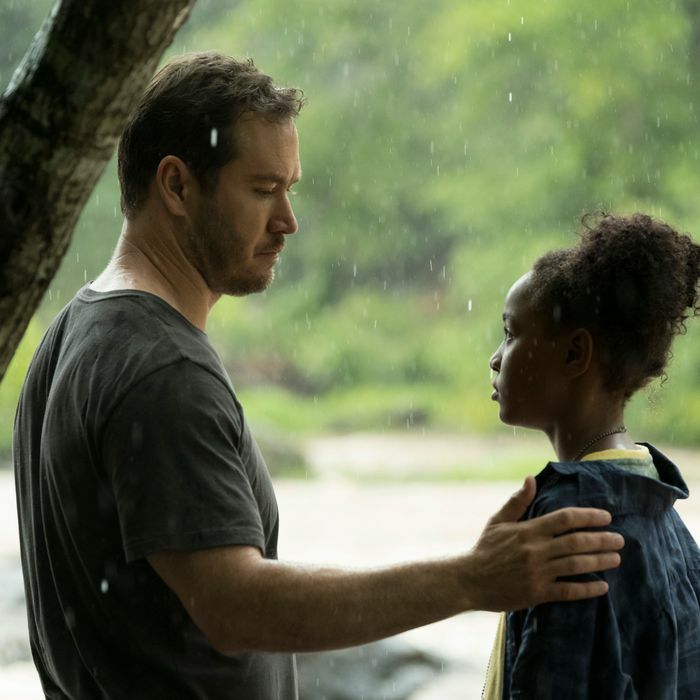 “My name is Amy Belafonte,” the young protagonist of The Passage says early in the series’ first episode. “This is how the world ends.” It’s an attention-getting line. It’s also, assuming The Passage even loosely continues to follow the plot of the novel from which it’s adapted, no exaggeration — though it’s tough to talk about why without getting into spoilers. Speaking broadly, Justin Cronin’s 2010 novel The Passage takes place in two different periods: the first in the very near future, the second nearly a century beyond that. Between the two, to be as vague as possible, stuff happens. Bad stuff. With vampires. Lots of vampires. It’s a big story spanning many years and several states, and it’s just the first installment in a trilogy. How deep The Passage will get into Cronin’s narrative, in the first book and beyond, remains to be seen, but if the series keeps up the pace of this first episode, it won’t have long to figure it out. Before the opening credits, the episode has established its premise, introduced all major characters, laid out the basic rules of its universe, and set up an unfolding medical catastrophe — all before promising the end of the world. It’s breathless and intriguing, if a bit modestly scaled. In bare description, The Passage sounds like it would make more sense as a series of films — which at one point it was intended to be — or a Westworld-budgeted cable show. It’s neither, but the best parts of this first episode find it treating its limitations as a strength rather than a weakness, relying more on the relationships between characters than on set pieces or special effects. Not that it doesn’t have those. Much of the action takes place at a luxurious Colorado hotel that’s been remade as the state-of-the-art home of the ominously named Project Noah, home base of Dr. Jonas Lear (Lost’s Henry Ian Cusick), whose friend and colleague Tim Fanning has become Patient Zero for a mysterious new disease he contracted in the Bolivian highlands. A disease contracted after being bitten by a man said to be 250 years old. A disease that’s left him with a thirst for blood. That kind of disease. It’s also a disease whose strange healing powers Project Noah is attempting to harness by testing it on death row prisoners. So far, this hasn’t gone as well as might be hoped, leaving the test subjects housed in glass cells in seemingly permanent fugue states. Some look monstrous. One is a neo-Nazi. Another, named Babcock (Brianne Howey), looks perfectly normal, apart from her soulless stare. They don’t do much behind their cell walls, but they do have the ability to slip into the dreams of the living — including a new addition from death row named Anthony Carter (McKinley Belcher III) — a talent that will surely have consequences down the line. One of the cleverest conceits of Cronin’s novel is that its monsters, which come to be known as virals, have most of the stock vampire abilities, no matter how potentially corny. It’s as if a creature from an old Universal Studios monster movie had been dropped into a setting much like the real world. The series seems intent on retaining that, giving us vampires confined in a high-tech lab with the ability to mesmerize those they come into contact with and who sometimes hang from the ceiling. It’s a fun touch, even if some of the human inhabitants of that setting don’t yet seem as compelling as their undead subjects. What is compelling, however, is happening miles away from the vampire action — at least for now. Project Noah obtains its subjects, we learn, with the help of federal agents. These include Brad Wolgast (Mark-Paul Gosselaar), a former special forces operative with a gift for talking the condemned into participating in what they only know to be a medical experiment that could help cure incurable diseases. He’s a hard man who’s seen some hard times, including war, the death of his daughter, and the subsequent dissolution of his marriage to Lila Kyle (Emmanuelle Chriqui), a woman who still cares for him. When he’s tasked with bringing in Amy, a recently orphaned girl no one will miss, because the experiment might have better effects on the young, he doesn’t even blink, at least at first. After all, he’s working for the greater good. One of Ursula K. Le Guin’s most famous stories, “The Ones Who Walk Away From Omelas,” considers whether a utopia predicated on suffering, even the suffering of just one person, can be considered a utopia at all. The Passage asks a similar question, even if it doesn’t entertain it for all that long. It doesn’t take long for Brad to grow fond of Amy, fond enough to abandon the job in an attempt to protect her. The best moments of the pilot belong to Gosselaar and Saniyya Sidney, the promising young actress playing Amy. The series can do a lot wrong as long as it gets that relationship — between a father missing his daughter and an orphan who’s never had much in the way of parenting — right. And so far, it’s doing just that, letting them bond at a carnival and consider what they’ve lost by the side of the river. Their escape attempt gives the series’ title its first, if not final, meaning. “It’s going to be okay,” Brad tells Amy after they flee a gun battle. It’s the sort of thing parents tell a kid even if they don’t know it to be true, but know they’re going to try their best to make it true, even with the end of the world on the horizon. Finding out whether he’s right, so far at least, is the best reason to watch the next episode. • Another reason to keep tuning in: There’s a good reason this pilot feels a bit patched together. Credited to two directors, Jason Ensler and Marcos Siega, it’s the second pass at a first episode. Siega directed the first version. This final version keeps some of that and adds new scenes and characters. I’m not sure which comes from which, but it’s likely that the vision of showrunner Liz Heldens — a veteran of Friday Night Lights and The Orville — will become a little clearer in subsequent episodes. • Amy likes A Wrinkle in Time and Bob’s Burgers, which makes me like her even more already. • The blood troughs are a nice detail. • This episode makes effective use of both Fleetwood Mac and Valerie June, neither being traditional vampire music. Hopefully subsequent episodes will continue this trend. • “Holy dammit!” one character exclaims, in case you forgot you were watching a series on a broadcast network. • For the record, your recapper has read The Passage but will attempt not to let any knowledge of the novel find its way into these pieces beyond vague references. Your recapper has not yet read the subsequent novels, however, though he plans to at some point in the future. • I’m not sure that’s what Bolivia looks like.